You guys…all I can say about this cake is WHOA!! Like stop me in my tracks whoa! 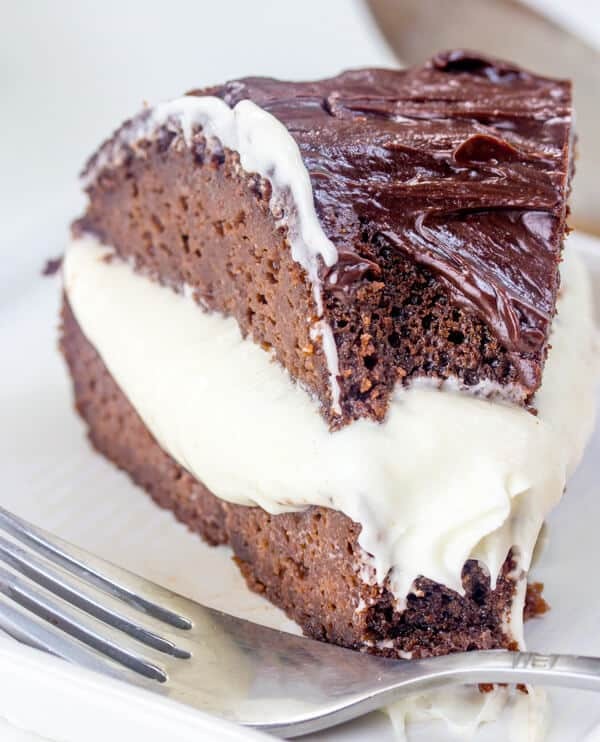 This cake is hands down the most moist cake I have ever tasted, seriously. It literally melts in my mouth! And man I can’t get over it. If I could like not gain weight by eating a whole cake, then this cake would be gone in like 24 hours for real. This cake comes courtesy of my lovely friend Hayley from The Domestic Rebel! It’s straight out of her cookbook Two in One Desserts! This cookbook is filled with some of the most delicious and creative desserts you will ever come across! 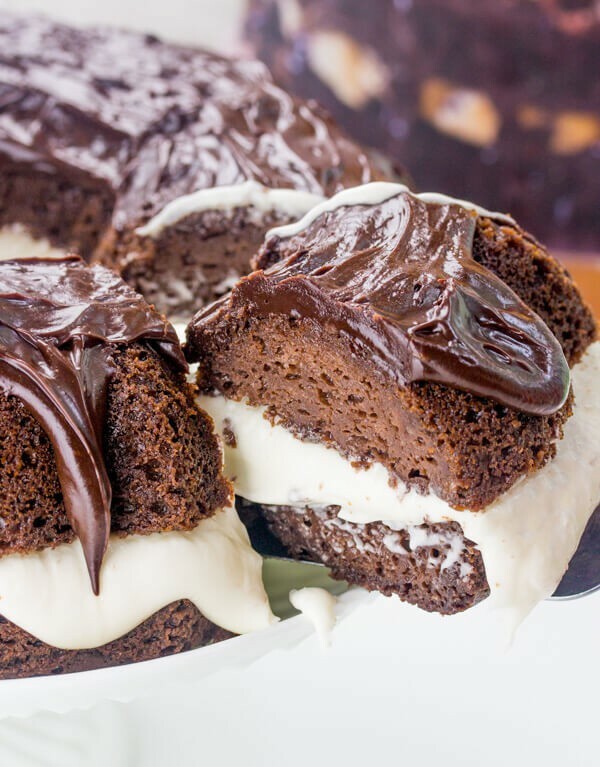 This Whoopie Pie Cake is just one of them! In the book you will find some gems like Cinnamon Roll Sheet Cake, Gooey Butter Cake Ice Cream and French Silk Pie Brownies (next on my list)! This is Hayley’s second cookbook! She also has an equally delicious one titled Out of the Box Desserts! 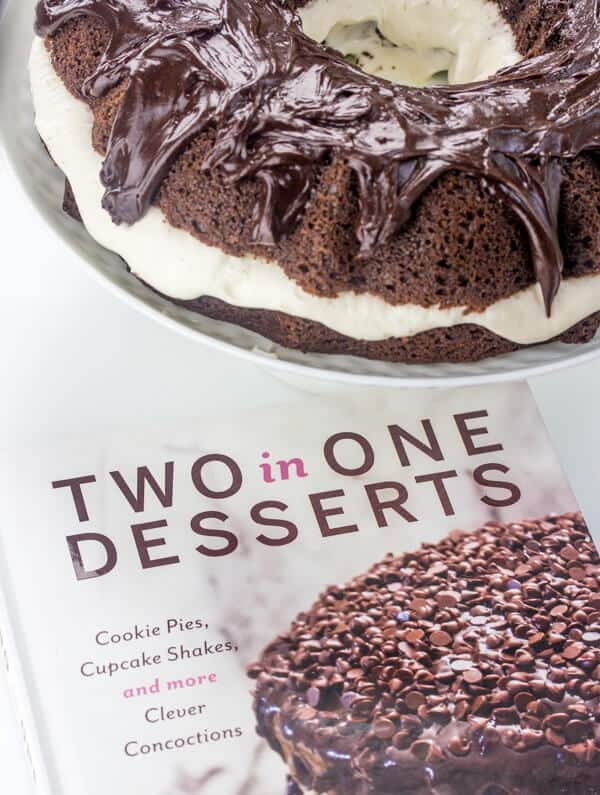 Two in One Desserts was just released on purchase, YAY!!! You can head over HERE to pick up yourself a copy, and you might as well pick up the other book two because you won’t want to stop making her goodies. 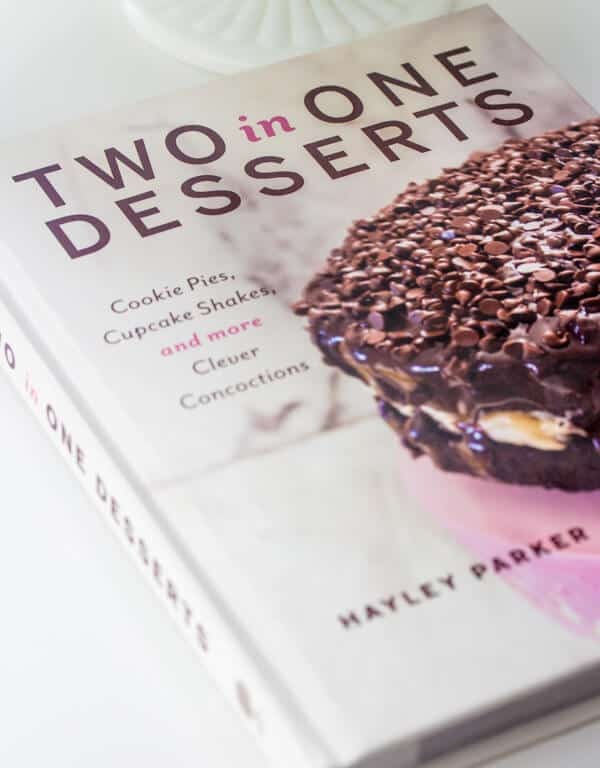 But since I love my readers so much, I want to give away one of Hayley’s cookbooks to one of YOU! Yes!! You know I love you right?! So obviously I’d only give you the best of the best and this book is seriously the best of the best!! I can’t stop looking, I want to make ALL THE THINGS!! So what you need to do to enter the Rafflecopter app below to get your name in and I’ll be drawing a winner SUNDAY NIGHT! I’ll email the winner and announce it on via my Facebook page as well so you won’t miss it, so if you don’t already don’t forget to follow me on Facebook so you never miss opportunities like these! Anyways, let’s get back to this delicious Whoopie Pie Cake! This bad boy is started off with a cake mix!! Yes a cake mix! But it’s enhanced to like the 10th degree! Literally the way that she added amazingness to this cake is so awesome! Then you fill it with a fluffy marshmallow filling and top it all off with some chocolate ganache. I mean how is that now heaven! This cake is so easy that pretty much any skill level of baker can make it! That goes with her whole cookbook to be honest. The instructions are very well written out and just the recipes themselves have an ease for the home baker to be able to follow along and just fall in love! Its a fun book to have your kids bake along with your that’s for sure. My kids couldn’t put it down and wanted me to make everything…we will slowly get there! 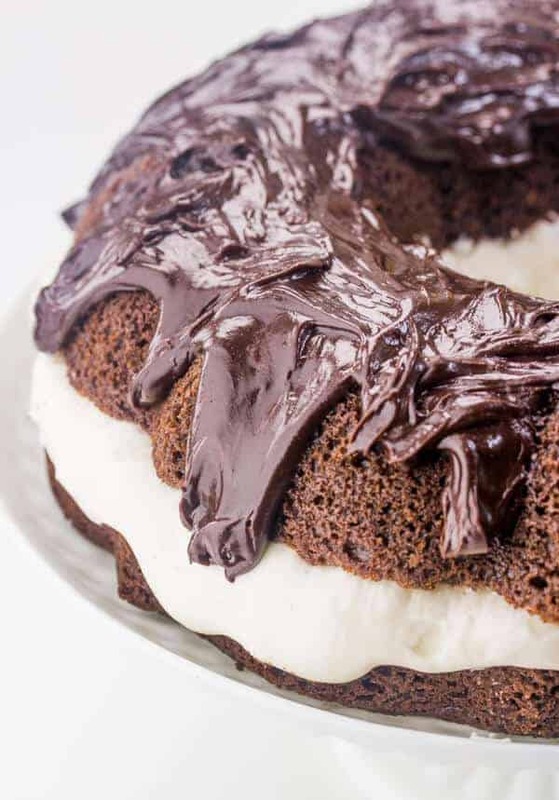 So if you want your chocolate fix, a throwback to childhood or just a down right delicious cake where you won’t be able to stop at just once piece then this Whoopie Pie Cake is screaming your name to make it NOW! Moist, fluffy and delicious this Whoopie Pie Cake is a amped up version of the classic treat that EVERYONE loves! Super easy and tasty, you won't put your fork down. Prepare a non-stick bundt pan with shortening and then spray liberally with non-stick cooking spray, set aside. In large bowl mix together with hand mixer your cake mix, eggs, oil, buttermilk and sour cream and pour into prepared baking dish. Bake in oven for about 30-40 minutes or until center is set and toothpick comes out clean. Let cool in pan for about 25 minutes before turning out onto cooling rack to cool completely. Once cool in another bowl beat together your butter, marshmallow fluff, vanilla and salt for about 2 minutes or until fluffy. Gradually add in your powdered sugar until combined. Then add 1/4 cup of heavy cream and continue to mix until incorporated and fluffy, set aside. Cut your cake in half horizontally removing the top and setting aside. Spread your marshmallow filling in the bottom half of the cake until you reach about 1/2 inch from edge. Smooth out top then replace the top of the cake. In a bowl add your chocolate chips. In another small bowl add your heavy cream and heat in microwave for about 1-2 minutes or until just starting to boil. Pour over your chocolate chips and cover and let sit for about 5 minutes, then remove and stir until ganache is formed. Pour over cake letting drip down sides. Looks really good. Bought her first book, so would really enjoy winning this one! That looks amazing! Just look at all of that creamy filling! 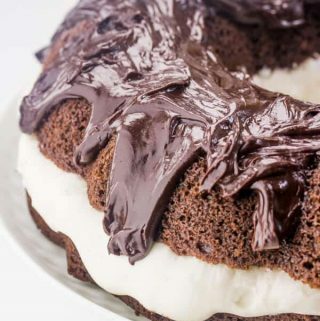 This looks amazing…….WHOOPIE!! 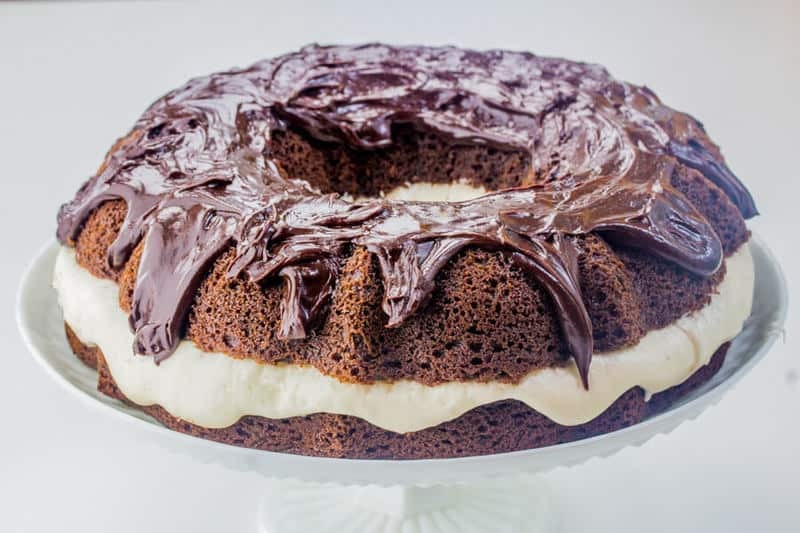 Well, I have a huge hole for sweet stuff & if all her recipes are as delightful as this one…..bring it on!! Her book(s) have been on my Amazon wish list for awhile now! I need to just get them cause I love all of her creative and easy desserts. This cake looks fabulous. Two in one cake I like to make is like the twinkles. Great tasting cream filling inside and a yellow cake outside so good. Would love to try a cookie pie! I bet there is some really yummy desserts in the books. Thanks for the chance! I love doing duo pies; two great pies, layered into one. 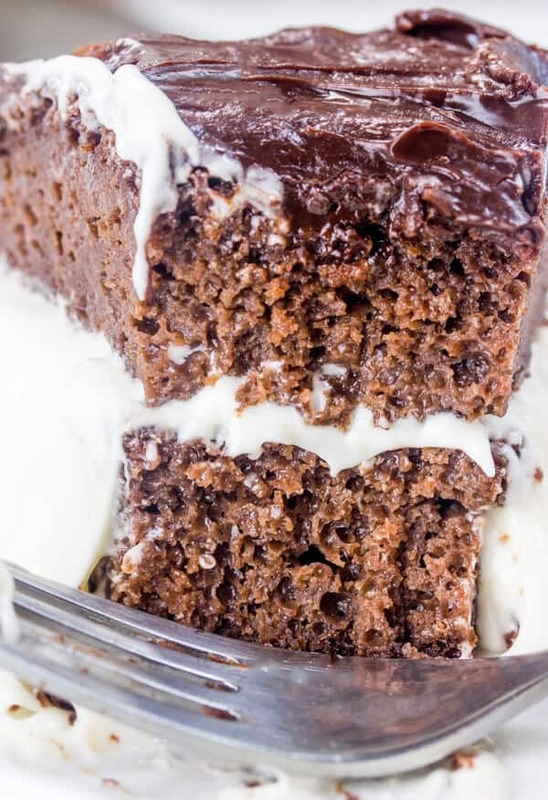 I make a brownie cheesecake that is amazing! Alli, this cake looks INCREDIBLE! Thank you so much for sharing it with the world and for your support! xoxo!